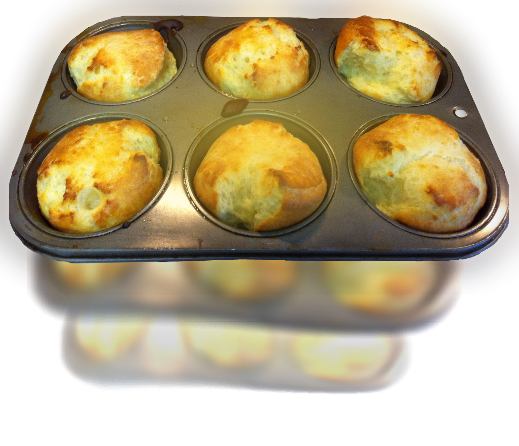 One of the most common complaints made by cooks is that their Yorkshires won't rise. Some customers at Blighty's put the blame squarely on Canadian flour. The solution, in their minds, is to use imported British flour. But Yorkshire Puddings are made all over the world mostly without the benefit of British flour. I made Yorkshire Puddings with Canadian all-purpose flour and they rose just nicely; here is how I did it. Customer, friend and Yorkshireman Harry Daisley has a simple secret to good Yo'ksher puds; he calls it his "2, 2 and 2 rule". You will also need a small quantity of oil or fat. Beef dripping is best but you can also use vegetable oil. Never use olive oil, butter or margarine, they burn at too low a temperature. Place a small amount of oil or fat into the cups of a muffin pan and place into the oven until the fat is smoking hot. This stage is very important, do not rush it and make sure the fat is really smoking!